On our last full day in Scotland, we returned to Edinburgh and spent the afternoon at the National Museum of Scotland. With limited time, we restricted our visit to the Scottish History and Archaeology wing. With a museum guide, time from the Palaeolithic era to the present day was compressed to fewer than two hours. The museum is exceedingly well laid-out and the artifacts, well-displayed. We lingered after the guided tour that compressed the time from the Palaeolithic era to the present day into fewer than two hours. I especially treasure museum visits as they almost always provide sources of inspiration. It may be color, line, texture, design--I never know what it will be. But I know that it is almost always there. I just need to slow down and drink in what surrounds me. 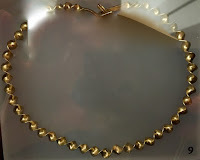 There is a beautiful display of jewelry made by the Early People, so named because they left no written history and little is known about them. Among my favorites were the recently discovered Iron Age gold neck ornaments (torcs) (left) and the Celtic brooch pin (above right). 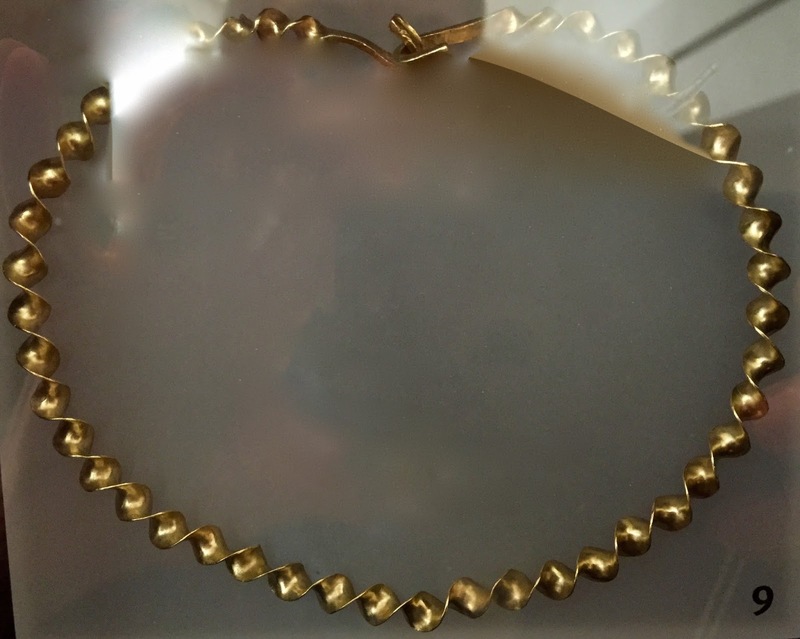 The torc is spectacular and its design, timeless. The museum obviously thinks so, too. The gift shop has beautiful replicas for sale. 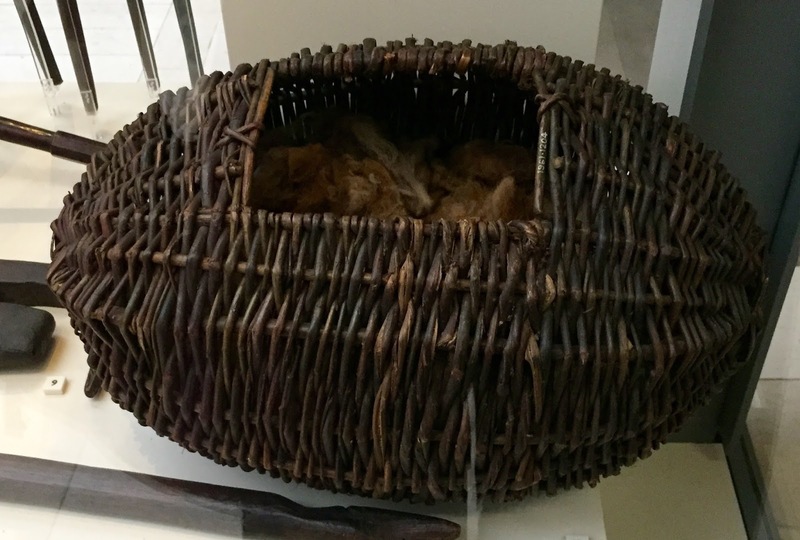 I also especially liked the woven willow wool basket, made on the Isle of Skye. Functional and beautiful. And perfect for storing wool to be spun. We also spent a lot of time in the galleries of historic textile equipment. All the machines I have heard of were there--and more. Many are original, but some are scaled down models of the originals. It is quite an impressive collection. There is a loom like the one at the Weaver's Cottage and there is a Jacquard loom, a mechanical loom that enabled weavers to produce complex patterns such as brocades and damask--and those for paisley shawls. 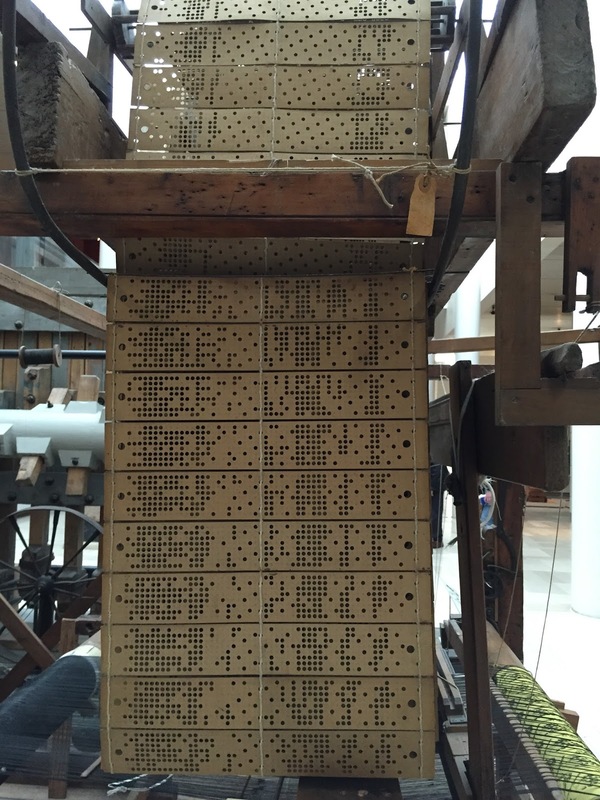 The loom is controlled by a series of punched cards, which are laced together in a continuous sequence. Don't they remind you of early computer punch cards? A young Chinese-American couple was also visiting. He works in the textile import business and showed us a photo of the machine in his factory in China that produces textiles. 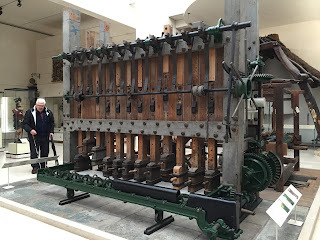 It was nearly identical to the Jacquard loom in the display. I was also drawn to the beetling engine, mostly because I'd never heard of such a thing. The huge machine was used to soften linen thread and also to add the 'glaze' finish on quality woven linens. Note the hooks for holding--and twisting--linen threads on the bottom left. I can only imagine the noise it would make pounding the material. The museum is a must-see for anyone interested--even a little bit--in Scotland, its history and its people.